DELIGHT . . .Derry boss Kenny Shiels. 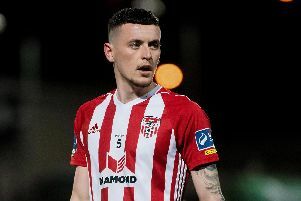 SUPER SUB Nathan Boyle netted a superb second half brace, including an injury time winner, as Derry City clawed their way back from a first half deficit against Galway United to stretch their winning run to three games. Kevin Devaney gave the Tribesmen a deserved first half lead but Kenny Shiels’ inspired substitution on 58 minutes changed the game as Boyle netted on 75 minutes from close range before racing through on goal to add his second on 91 minutes. The Tribesmen had frustrated their hosts in the opening 15 minutes with a well executed high pressure game. Derry’s first real chance came on nine minutes following a Gareth McGlynn free-kick which was punched clear by Galway keeper, Conor Winn. Rory Patterson kept it alive and cut back towards Harry Monaghan whose shot on the turn went over the bar. Galway took the lead on 24 minutes when Shanahan got in behind Dean Jarvis from a throw-in and the winger crossed into the danger area where former Sligo Rovers man, Devaney swept home from six yards. Derry responded two minutes later with a well hit strike on the half volley from right back, Niclas Vemmelund but the Dane’s effort went narrowly over the crossbar. Gareth McGlynn’s curling free-kick from the edge of the area had to be tipped over the bar by Winn on 36 minutes as Derry began to build momentum. And City skipper, Ryan McBride hooked Vemmelund’s cross from the right towards goal but Winn gathered cleanly. Folan’s close range header was gathered safely by Doherty as the half drew to a close and while Derry finished strongly with a succession of corner kicks, Galway were fully deserving of their slender advantage. Patterson chased on to a terrific pass from Vemmelund which played the striker in behind the Galway defence but Folan managed to get back and block the shot. From McNamee’s resultant corner kick McBride’s downward header went wide. Derry showed no real signs of getting back into the match until from Conor McCormack’s free-kick into the box on 75 minutes, Galway failed to clear and McBride’s deflected shot found its way to Boyle who arrowed his strike into the far corner past Winn for the equaliser. Winn made a terrific save to deny Derry substitute, Josh Daniels whose 20 yard strike seemed destined for the top corner with four minutes to go but the Galway stopper somehow turned it behind. In the first minute of added time Boyle chased a long ball, muscled off his marker and raced through on goal before applying a neat finish with his left foot to give the home lot maximum points. Derry City: G. Doherty; N. Vemmelund, A. Barry, R. McBride, D. Jarvis; G. McGlynn ( J. Daniels 66), H. Monaghan (N. Boyle 58), C. McCormack, Barry McNamee, R. Curtis ( A. McEneff 71); R. Patterson; Subs Not Used - M. McElhinney, J. Allen, K. Ward, P. McClean. Galway United: C. Winn; C. Horgan, P. Sinnott, S. Folan, S. Walsh; G. Shanahan, R. Connolly, J. Sullivan, K. Devaney (R. Keating h-t); E. Curran, V. Faherty; Subs Not Used - K. Horgan, K. Cantwell,C. Raferty, C. Melody, P. Cunningham, E. Foley. Referee - Adriano Reale (Kildare).